Brian, our ice climbing, bartending, order filling employee was at the Kohl Center last night. He didn't rush the court because he was sitting with a Duke fan. He felt that rushing down to the court would add insult to injury. 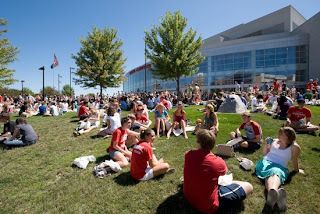 Kohl Center tickets for the upcoming Wisconsin Badgers basketball games are always available from Ticket King Milwaukee. Does this win mean that our Wisconsin Badgers are on the rise? Certainly. Compare the win to our Milwaukee Bucks two point loss, and you get the flip side of emotions. We're watching the first snow fakes of the season, as they pile up on the streets. That should make Christmas a bit more cheery. Ticket King Milwaukee Girls Night Out! Bogut Takes Command! Go Bucks!